What You'll Need: scriptures, picture of a baby, activity print outs for each child, coloring supplies or writing utensils for older children. Scripture: Exodus 20:12 - Honor thy father and thy mother: that thy days may be long upon the land which the Lord thy God giveth thee. Show a picture of a baby. 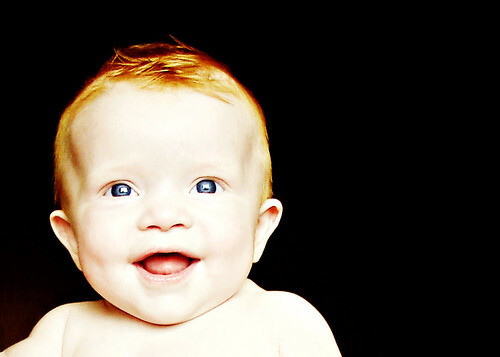 It can be a baby from your family or a photo of one of your children as a baby. • What can the baby do for himself? • What does the mother do for the baby? • How does the baby learn to talk? • How does the baby learn to walk? Explain that someone has to care for the baby. He or she depends on his or her parents for everything. They love the baby, and they spend their days and sometimes their nights watching over him. It is a very hard job, but parents do it because they love their children and want them to be happy. Heavenly Father has commanded parents to teach their children the gospel and other things they need to be happy. That is a special job Heavenly Father gives us. Heavenly Father has commanded children to honor their parents by obeying them, showing them love and gratitude, and respecting them. In 1974, the First Presidency stated: “Honoring your parents by living a good life and by showing them that you love and appreciate them are gifts that last forever. To your earthly mother and father and to your Heavenly Parents, you are their most valuable treasure. Their love and concern for you never ends” (Friend, Dec. 1974). We can trust our parents to want what is best for us. They love us and want us to be happy. One way we can find happiness is by obeying them. Share a story from your own childhood about when you did NOT listen to your parents and the bad consequences which followed. Even when we are small, we can show we love and respect our parents. 2. By listening and obeying when they ask you to do something (doing things the first time your parents ask you to shows that you love and honor what they are saying). 3. By always speaking to your parents with kindness (we should not yell at our parents, call them names or say rude things to them). Bear your testimony about how much you love your children and how you want them to be happy. Explain that this love and concern is the reason for rules and directions you give them. Print and color this page from The Friend magazine. 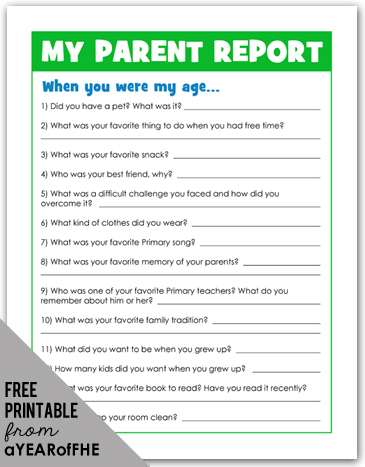 Have children ask questions to each parent from the worksheet. This lesson was PERFECT!!!! Thank you so much!!! Loved this lesson, it was just what we needed to teach my little boy! 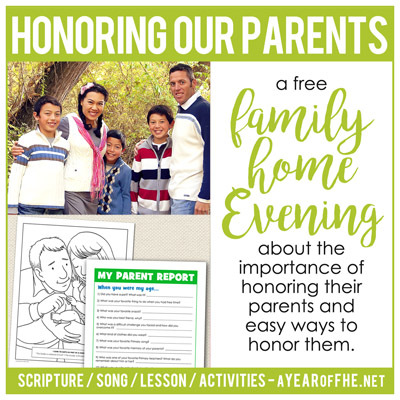 We loved the 3 easy ways to honor your parents and the activity to tell about yourself. Thank you! I loved this lesson. We are trying to cover all of the things listed in "My Gospel Standards." I was struggling with this one. Thank you! This is great! I have a 3 year old boy and I have to keep our lessons short and sweet and I loved that this lesson could be short or long and easlity adaptable depending on a child's age. 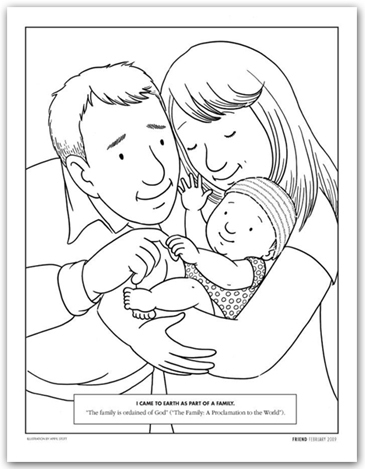 I really love that the coloring page is here and the link to the song. Thank you so much for this! Thank you for the lesson. I appreciate being able to quickly find a lesson on busy days. THANKS!! This is just perfect for what we were wanting to do for FHE this week! Thank you so much! Thanks so much for this lesson. It is one my 4 and 2 year old really need to hear this week. I really appreciate all the hard work you do to help out parents like me. I hope you are very blessed for your efforts. We are talking about commandments this month in Primary. This will be a perfect extension at home! This was just the lesson on obedience I was looking for. Thank you for sharing your time and talents with us. Thanks! We are doing this tonight! For our littles on Wednesday nights we are learning the 10 Commandments and for 6 weeks we are studying each commandment(sometimes 2) This lesson is spot on for my preschool littles and works great right here at Mother's Day too :-) Thank you for the time it took to put all of these together. Thanks for the post!! It was exactly what our family needed today. Have been using your lessons for a couple weeks and have loved them! Thank you for making it easier for our family to live the commandments! Thank you! We'll be using this one for FHE this week! Thank you! This will be perfect for our lesson tonight! The link to the coloring page was broken when I tried to use it, but I found this picture (maybe it's even the one you linked to) that will be perfect. https://www.lds.org/bc/content/shared/content/images/gospel-library/magazine/fr09feb48_color.jpg Thanks again!